(Tee Vee Records) 20 tracks. Of the three singers who died on Randy Hughes' ill-fated March 5, 1963 flight to Nashville, Patsy Cline endures as a country music icon. After more than four decades, her back catalog still does brisk retail business. Cowboy Copas and Hawkshaw Hawkins fared less well, their names quietly slipping from public memory and their recordings haphazardly reissued. Although both recorded prolifically, Copas arguably left a more enduring legacy. Copas shined in the studio, imparting his distinctive personality and style onto whatever material he chose or was handed. By contrast, the mercurial Hawkins gave his best performances on stage. Heading one of country music's most dynamic touring ensembles, the lanky entertainer earned the title 'Eleven and a Half Yards of Personality,' dazzling audiences with songs, jokes and breathtaking demonstrations of bullwhip and sharp shooting skills. 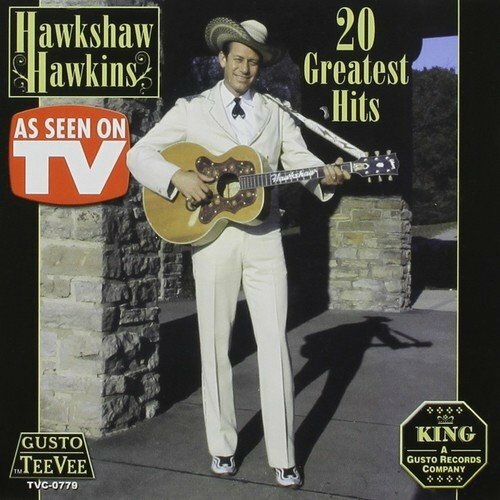 But in the studio, Hawkins was a country music Zelig, often interpreting songs by parroting the styles of other popular singers. Whether conscious or not, this ability initially worked in Hawkins's favor. Syd Nathan likely signed him to King Records to cover material by other artists, especially Ernest Tubb. For his Saturday night broadcasts on the WWVA Jamboree in Wheeling, West Virginia, the singer could duplicate the week's jukebox hits with sincerity and precision. Hawkins was an unquestionably gifted vocalist with a natural affinity for blues-based material. But to paraphrase a critic who once complained about pop vocalist Eddie Fisher, Hawkins was blessed with a great voice but didn't know how to use it. Otto Kitsinger, who annotated a 1991 Bear Family box set of Hawkins' RCA Victor and Columbia material, argued the singer's inability to develop a readily identifiable style inevitably worked against him. "Hawkins' very versatility and effortless singing of all types of songs was his own worst enemy," Kitsinger claimed. 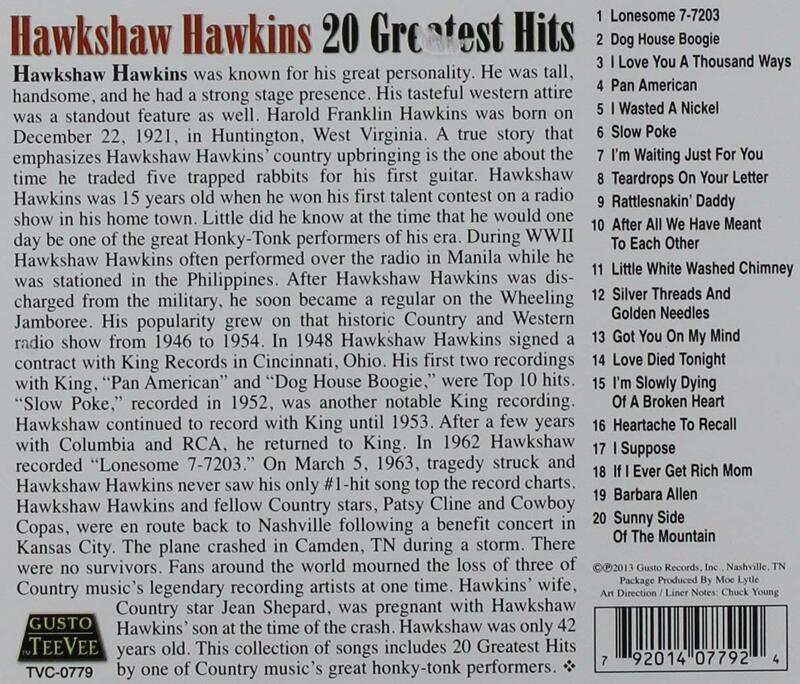 "Neither vocally nor instrumentally was there a Hawkshaw Hawkins sound by which the audience immediately recognized the singer was Hawkins." The oldest child of Alex and Icie Hawkins, Harold Franklin Hawkins was born December 22, 1921, in Huntington, West Virginia. The family briefly lived in Lawrence County, Ohio, where a second child was born October 1924. A third and last child was born in Huntington in 1934. Although his parents were not musically inclined, Hawkins was self-motivated, becoming proficient enough on the guitar to make an early radio appearance over WCMI, Ashland, Kentucky. In 1935 he entered a talent contest sponsored by WSAZ, Huntington. Besides taking top honors, the youth's performance led to a radio job paying $15 per week. By age 16 he dropped out of school to work as a full-time entertainer. Radio Dot and Smokey and Jake Taylor, two now-obscure WSAZ acts that joined the station in 1939, took Hawkins under their wings, offering professional advice about how to attract and maintain an audience. Hawkins next teamed with Clarence Jack, who played 'Sherlock' to his 'Hawkshaw.' Emulating the brother acts of the era, Jack sang lead and played guitar, while Hawkins harmonized and played guitar and mandolin. Drawing upon such surefire standards as In The Pines and Little Pal, Hawkshaw and Sherlock were featured on WSAZ with occasional Saturday nights on WCHS, Charleston. During the next two years the duo worked a circuit of theaters, schools and churches across West Virginia, Kentucky and Ohio. When jobs shriveled up, Hawkins supplemented his income by driving a cab or working in a nursery. In 1941 Hawkins married Reva Barbour, whose desire for her husband to hold a regular 'nine-to-five' job created an often-contentious relationship. That spring Hawkins and Jack joined Kid Carson's traveling Wild West Show, working a northeastern circuit before settling into Lawrence, Massachusetts for the summer. While there, the duo sang over WLAW, Lawrence. With the outbreak of World War II, Hawkins and Jack both found employment in a Baltimore shipyard. In November 1943 Hawkins entered the U.S. Army, reporting for training in Paris, Texas. Eager to perform, he approached the local Dr. Pepper bottler about sponsoring a fifteen-minute show over KPLT. Rising to the rank of Staff Sergeant, Hawkins was shipped to France, earning battle stars for his participation in the Battle of the Bulge. After V-E Day, Hawkins was sent to the newly liberated Philippines, where he entertained American troops over a Manila radio station. Returning home after his army release in early 1946, Hawkins wanted to reconnect with Jack, but his former partner regretfully declined the offer, citing wartime injuries that impaired his guitar playing. Now booking himself as a solo, Hawkins joined the Hayloft Frolic Gang, playing daily over WKST, New Castle, Pennsylvania. Hawkins also arranged for an audition with Syd Nathan of Cincinnati's King Records. Formed in 1943 and incorporated in August 1944, King found its niché by producing straight country records at a time when Western swing bands and cowboy crooners dominated the jukebox trade. Nathan probably saw Hawkins as a potential rival to Ernest Tubb, whose melodic, stripped down Decca records launched the modern honky-tonk era. When required, the singer could also deliver a reasonable Eddy Arnold or Red Foley facsimile. 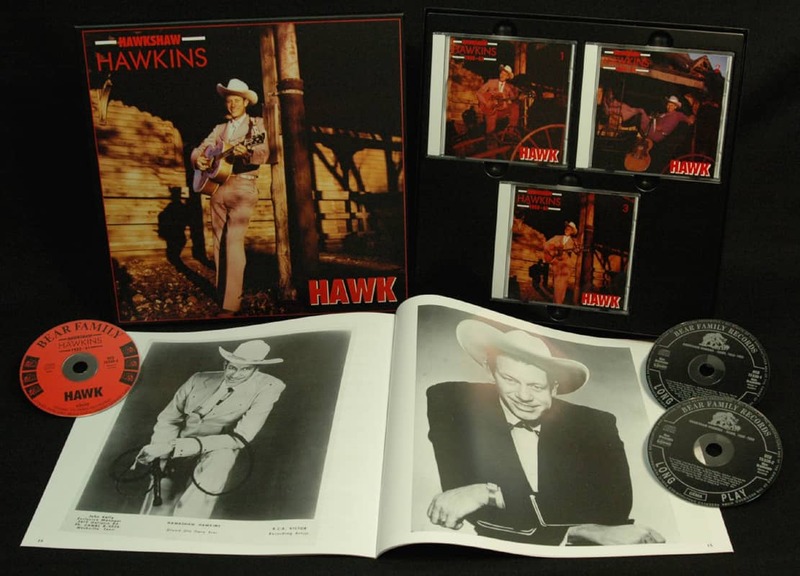 Recorded in early 1946, Hawkins's first records had the Tubb formula down pat, right down to mimicking Leon Short's single-string guitar leads. 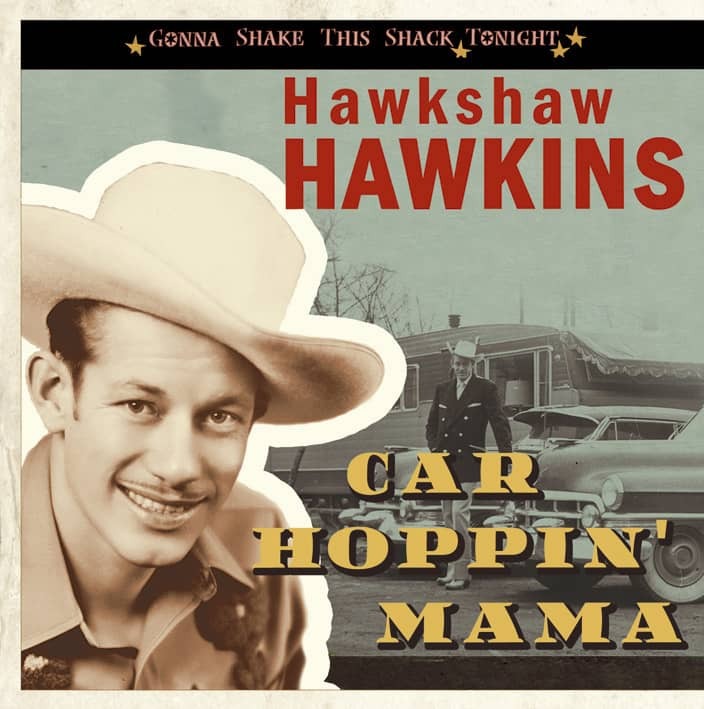 When The Texas Troubadour covered two sizable King Records hits in a September 17, 1946, Decca session (Rainbow At Midnight by the Carlisle Brothers and Filipino Baby by Cowboy Copas), Nathan retaliated by bringing Hawkins back to Cincinnati to record fifteen Tubb standards. Nathan released all fifteen simultaneously across on eight singles, barely nicking Tubb's back catalog sales while ironically swelling his publishing income (two of these Tubb covers, I'll Get Along Somehow and Mean Mama Blues, appear here). The concept apparently worked well enough. The following spring Nathan recruited Esco Hankins to record sixteen Roy Acuff hits, which were immediately released on eight King singles. The stunt inevitably damaged Hankins' reputation; to this day many unfairly dismiss him as an Acuff imitator. Customer evaluation for "20 Greatest Hits (CD)"